If you – or someone you know – is already in (or considering) a career where you are making a difference on sustainability issues, we’re delighted to have you on this journey. Truly, there won’t be (we hope!) a separate track of sustainability careers: we’re all going to be contributing no matter what our field. We’re heading into a time where making our world a more sustainable place is going to be mission critical for all of us — and it’s an exciting time where we’re going to be redesigning every part of our society to meet that important and urgent calling. From engineers to teachers, dentists to dancers. All the better that there are a lot of us getting started now. Learn about how people have maneuvered through their careers, often switching sectors and taking advantage of timing and place. In Dagmar’s speech to MBA students, she told the stories of world-changers from a variety of backgrounds. A key message: you can make change happen whether you are working in a “sustainability” job or in a family business. There are leaders working across all sectors. One of the best ways to get experience early on in your career or when you are transitioning to take on a sustainability focus is by volunteering your skills and time. If you are doing so full-time, you will want to consider a more formal 6 month (or longer) work period. You can do so through an internship program or by approaching organizations directly. Explore One Earth’s volunteer opportunities by contacting us. Do your homework before reaching out to an organization. Research the current projects of the organization as well as the key individuals: use this to inform your offering, both in terms of whom you approach as well as what you are suggesting. Some organizations may not list volunteer positions but be open to meeting you and exploring opportunities especially if you show a knowledge of the organization and a passion for its mission. Be open to new ideas! There may be a project or direct need that has emerged and which you can support. Even a short-term effort is worthwhile as it allows you both to get to know each other and see if it’s a good fit. Have a clear sense of the time you can offer, on what basis (e.g., 10 hours a week; one paper a month), and until when (e.g., for the next 3 months). Reflect on your transferable skill set and strengths: are you a strong writer, a great researcher, a competent organizer, good with details? You want to be able to express those to the organization in addition to sending a current CV. Don’t underestimate skills you may not use professionally like blogging, web design, graphics. Those are often a great foot-in-the-door! We all bring different gifts and you do well to know yours. If you’ve received an indication that your support and skill set is of interest, be persistent: sometimes your timing coincides with a big event which overruns an organization’s capacity. Try again a month later, or when there needs may have shifted. If you don’t fit with that organization – at that time – seek suggestions of others who might welcome your help. Ask for an information interview to learn more about the type of work and what a career in that field could look like. In person is nice but not essential. You may ask for 20 minutes by phone and have a set of conversation starters at hand, being prepared but also ready to flow with the conversation. To get started, you might want to ask open-ended questions like: what inspired you to follow this path? Alternatively, meet people where they are: are they speaking at an event? Are they regular members of a group like Connecting Environmental Professionals? Approach them there as appropriate and see if something emerges. We’ve met amazing team members that way! Vanessa and Dagmar teach part of the Simon Fraser University Certificate in Sustainable Community Development. It’s a great part-time program for mid-career professionals, ideally suited to professionals throughout Canada who want to implement sustainable development practices in their communities. Topics include economics, social dimensions, and making change happen. Learn more. Dagmar facilitates the award-winning University of British Columbia Summer Institute in Sustainability Leadership, which brings together participants from around the world to engage with top speakers for a week-long intensive training program that covers a diversity of topics of relevance to sustainability. Learn more and watch the short promo video. We all seek the holy grail of a position that matches our convictions, needs, and competencies. People who want to make a difference sometimes ask me for advice on how to find a job in the “sustainability sector.” The bad news is that there is no such sector, any more than there is a “quality sector.” The good news is that there are roles in organizations that include varying degrees of responsibility for sustainability: in the organization, with its suppliers, and/or helping its clients become more sustainable enterprises. 1. Decide where you would be most energized. 2. Work your existing network. 3. Shop your non-sustainability skills, match your values. 5. Embrace a non-linear career path. 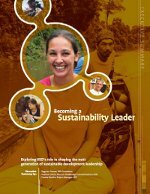 In the 2007 study of the International Institute for Sustainable Development’s internship program, Dagmar Timmer, Heather Creech and Carolee Buckler explored the value of a 6 month internship for starting a sustainability career. They identified 21 key skills and 15 core values of a sustainability leader. These include strong communication skills (including the ability to translate complex ideas), a global mindset, and a capacity for innovation. Read the Executive Summary or full report here. Good Work Canada: A website connecting passionate, green-minded people with opportunities to contribute and be employed. Eco Canada: ECO Canada provides resources to help individuals learn about, train for, and find environmental careers. United Nations Vacancies: A listing of UN international vacancies categorized by occupation. In major cities across Canada, consider joining Connecting Environmental Professionals. Many of the One Earth team members are part of CEP Vancouver, which hosts training opportunities, speakers, socials and even has a mentorship program. Many cities across the US and Canada host Green Drinks, an informal monthly networking event called for those working in the environmental field across all sectors. If you are trained as an engineer, a doctor, a teacher, an architect…, explore the “Without Borders” groups for networking and meaningful opportunities, e.g., Engineers without Borders. This could be worth investing in: Wholonomy Consulting's Student Guide to Networking ($9.99) for tips (with thanks to 4Good for the reference!). Check this website for volunteer opportunities in Vancouver. These and other employment resources are posted on IISD’s website, including skills development programs, internships, and job boards. Dagmar was an intern with the International Institute on Sustainable Development. The Young Leaders for a Sustainable Future (YLSF) Program has placed over 400 Canadian young leaders with partner institutions in 40 countries in Africa, Latin America, Asia, Europe and North America. The alumni program has built a long-term community of peer support for participants as they take on new leadership challenges in government, business and civil society. As part of the Canadian government’s Youth Employment Strategy, IISD sponsored career-enhancing placements program to send Canadian youth to international business councils, trade organizations and sustainable development institutions for 6-8 months. In 2012-13, these included UNEP, IUCN, Iwokrama International Rainforest Program, ICRAF, the Association for Progressive Communications, the Human Development Network (REDEH) and LEAD International. Some of their stories are here. Do good work. Network and make connections. There are many paths to the end (not one way). Have a good overall understanding of the issues/science/politics/personalities, be ahead in your (not necessarily detailed) knowledge of certain areas that might be pioneering (such as nanotechnologies, second generation biofuels, etc if involved in policy work) in which others then rely on you for information/advice, have a good professional/personal reputation and relationship with all and position yourself under a boss/mentor who can help push you upwards within the organization. Two pieces of advice that I received that has been great for me: 1. When you start in development, go somewhere where you can see the lights go on. 2. At the beginning, go somewhere no one else wants to go. You will learn much more. Getting ahead is not just about your skills and experiences, but it is what you can do with them. Go out and experience very different things if possible, whether that includes very different roles or working in very different environments/countries. Again, being able to locate key leverage points is key. It is very easy to get too focused on less important areas of change. Taking a multi-disciplinary approach: it may be more difficult but the results are almost sure to be significantly more relevant and interesting. Take a risk and shake up your career path – it will be the best decision you can make. Draw on your strengths and interests and find your passion, continually identify and build on your knowledge base, skills and experience, and be sure to network and nurture supportive relationships. Finally, a mentor or a career coach can be a great asset. Be pragmatic and think long-term – Rome wasn’t built in a day. Focus on the small wins and determine leverage points and battles worth fighting for. Getting on your soap box every time something crosses your “value” system will not always create the long-term outcomes you’re striving for and will, likely, paralyze whatever momentum you once had.